Last week, a panel of three federal judges struck a powerful blow against partisan gerrymandering with a landmark opinion that declared North Carolina’s egregiously gerrymandered congressional map unconstitutional. Although a lot of the initial buzz around the opinion by Fourth Circuit Judge James A. Wynn has centered on the prospect of North Carolina’s map being redrawn, the opinion is striking in another regard: It makes many of the thorniest and most hotly contested issues in these cases seem, well, pretty simple. In fact, while the Supreme Court has long wondered whether courts could easily handle partisan-gerrymandering claims, the North Carolina panel’s decision shows that these claims are not only manageable, but also similar to the types of things courts have done for decades in a variety of other cases. Social science has come to play an important role in partisan-gerrymandering cases, but its importance is frequently overemphasized or misunderstood. The panel’s opinion cuts through the confusion, offering a simple way to understand the role of social science by distinguishing between “standards” and “evidence,” and putting social science in the “evidence” basket. Evidence consists of facts—pieces of information—that help courts identify when a standard has been violated. In the North Carolina case, there’s a lot of evidence. Take, for example, legislators’ on-the-record statements about their intent to create a map that would reliably give Republicans ten congressional seats and Democrats three. And electoral returns showing that they succeeded. Social science is another important type of evidence, which can help confirm what other evidence seems to show. Partisan-symmetry measurements (like the efficiency gap or mean-median difference) show that North Carolina’s map produces 10-to-3 congressional delegations because it makes it systemically harder for Democratic voters to win elections. Large collections of simulated maps show that Democratic voters’ disadvantages in winning elections are the result of the mapmakers’ intentional choices. Even Supreme Court Justices and experienced commentators often miss this standard-versus-evidence distinction. In the process, they fall into a common trap of assuming that plaintiffs in partisan-gerrymandering cases are asking the Court to “constitutionalize social science.” Really, plaintiffs are just asking the Court to provide a standard. 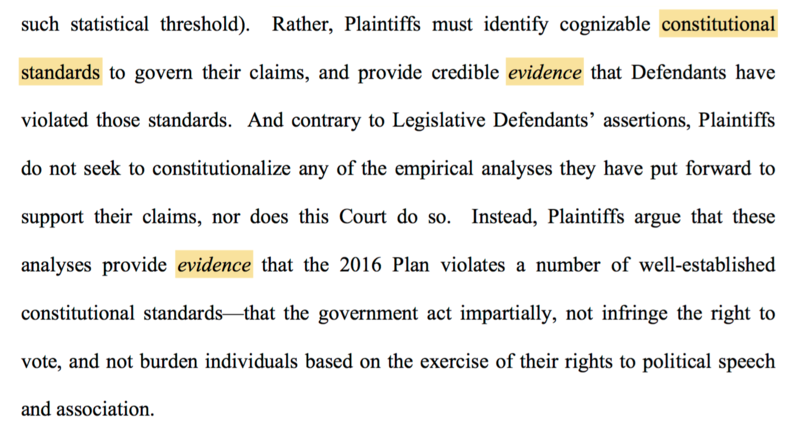 And, in exchange, they’re offering evidence (including social-science evidence) that courts can use to figure out whether the standard’s been violated. Others have written about how the North Carolina has vindicated the social science for measuring gerrymanders. The decision has done that. But perhaps its greater import is that it situates the social science in the proper context: Social science is evidence and just that. In the end, a map isn’t unconstitutional because a social-science metric gives a map a score of X percent or Y percent. The map’s unconstitutional because it treats voters unfairly, and the metric—along with a lot of other evidence—helps the Court see that there’s some unfairness intentionally baked into the map. The panel also points out that the use of social science to help solve legal problems is nothing new in American constitutional law. In fact, absolutely foundational Supreme Court opinions are based on it. While some of the evidence on which the Court has previously relied is simple “descriptive statistics,” some of it is more complicated. For example, the Court has used advanced techniques to measure racially polarized voting in cases brought under the Voting Rights Act, to identify violations of antitrust law, and to reshape courtroom procedures. Given all this, the uniqueness of partisan-gerrymandering claims doesn’t come from their use of math, statistics, and other methods developed in the academy. Instead, it comes from the strange unwillingness of courts to use those methods to solve gerrymandering when they’ve embraced them for so many other important problems. Sneaky map-drawers who have been caught red-handed frequently claim that it’s impossible to gerrymander—that is, reliably game a map in favor of one party—because it’s impossible to predict how voters will vote. Similarly, when faced with social-science evidence that shows how elections would turn out differently if district lines were drawn differently, they argue that every election is unique. In two simple moves, the panel dismantles these defenses. First, the panel shows how experts can predict outcomes simply by comparing how precincts voted across multiple elections involving different candidates and different seats. As with much of the evidence in this case, a plaintiff’s attorney could not have scripted it any better. Crucially, however, this behavior isn’t unique to North Carolina. As we’ve seen in other recent cases where plaintiffs were able to get discovery—such as Wisconsin, Maryland, and Pennsylvania—legislators and their consultants have gerrymandering down to a science that’s only going to get more precise and damaging as time goes on. When mapmakers are drawing lines, they’re not making guesses based on some earthy and imprecise folk wisdom. Instead, they’re relying on increasingly abundant data about how voters actually vote, data that’s frequently converted into indexes that can be used to predict, very accurately, how specific precincts will perform in many different scenarios. How else could mapmakers justify the fees they charge for their “services”? For decades, federal judges have debated whether the judiciary could risk getting involved in partisan-gerrymandering disputes. When the Supreme Court last took up the issue in the mid-2000s, a majority of Justices seemed to think it was better to stay out. As the panel explains, however, times have changed and the calculation has flipped. Novelty, the panel continues, is no longer an excuse for inaction. With forceful arguments like this, the panel isn’t simply resolving a dispute between the parties. It’s providing an extensive and pretty colorful account of the federal courts’ role and responsibilities, one that speaks directly to the Supreme Court’s hesitations. The panel’s last major contribution isn’t any single passage, but rather, the sum total of what its opinion demonstrates: While the Supreme Court has been hesitating—with some members of the Court even calling the social science “gobbledygook” and comparing proofs for partisan-gerrymandering claims to recipes for steak rub—the district courts have been moving ahead, responsibly and sure-footedly. The North Carolina case marks the second time in a little over a year that a court has been able to convert the kinds of arguments and evidence presented by the plaintiffs here into a coherent ruling against partisan gerrymandering. (The panel opinion in the Wisconsin gerrymandering case, Gill v. Whitford, is the first.) The authors of these opinions include both Democratic and Republican appointees, who—while undoubtedly experienced and capable—aren’t social-science experts. Using these opinions as guides, it would be easy to handicap the likelihood of a map being struck down and to explain why a map crossed a constitutional line. So, in the face of any lingering concerns that partisan-gerrymandering claims are too hard for the courts to handle: Proof’s in the pudding.